My name is Michelle Vink and my husband is Scottie Vink. We have been married for 6 ½ years. During the first 3 years of marriage we were unable to have our own biological children. Before we got married, we had always talked about adopting children, because both my husband and his younger brother were adopted by his aunt and uncle when they were 6 and 4, so we always knew that we wanted to adopt, we just had planned on doing it after having biological children. So after years of struggling with getting pregnant, we finally both agreed it was time to look into adoption. At first we looked into infant adoption, but unfortunately that was a little more expensive then we could afford, so my husband one day started looking online for foster care agencies and we came across Youthville in the Olathe area and were sent out information immediately. We then took our classes and absolutely loved our class and our mentor!!!! 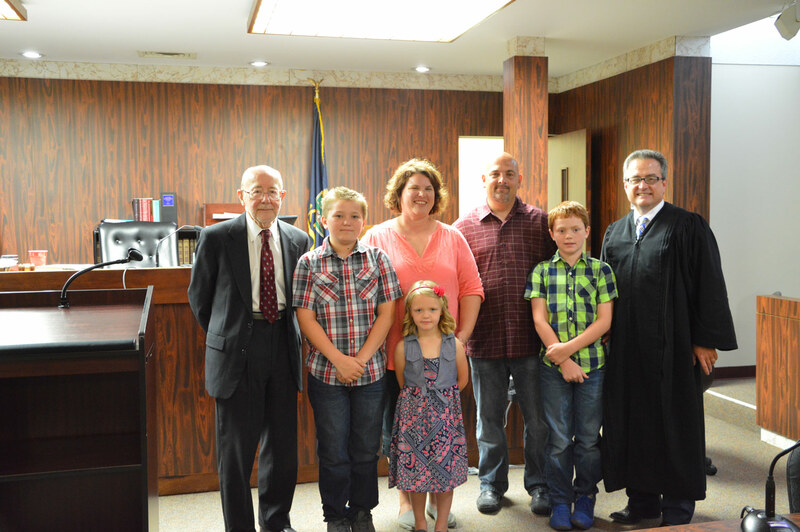 We did everything we needed to do and took the classes we needed to take and finally in January of 2014 we became licensed foster parents with the hopes of eventually adopting as well. Months went by and we weren’t getting any placements for kiddos and then we would get some calls for placements that we unfortunately were unable to take. We did respite a few times and we had gotten to the Best Interest Staffing a couple times on sibling groups, but we were never chosen to be their forever home! We were getting very frustrated and had started to question whether this was the right thing for us after getting so close a couple of times. We went away for our Fifth year anniversary and on the actual date of our anniversary our case worker sent us an email saying that there were 2 brothers Axavier(10) and Zetan (8) who she thought would be a perfect fit for our family. We read the email and immediately felt the same way she did and told her we were interested. We did the phone interview, which we had done before and had tried to not get our hopes up again, but this time, my husband told the lady that these boys would be perfect for us and they needed a home and we had one for them and they didn’t need to look any further. 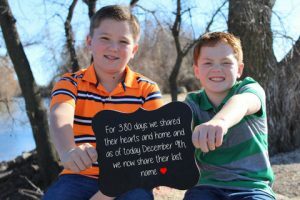 A couple of weeks later, actually it was the night the Royals lost the World Series that year, we received a phone call from our case worker and she said that we were chosen to be the home for these 2 boys. We went and visited with them and took them out on a Saturday and the next weekend they came and stayed with us and fit in wonderfully with the dogs and cat. Then on November 23rd, 2014, which happens to be Scottie’s birthday, they moved in with us. 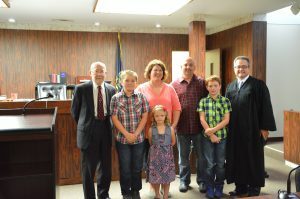 They adjusted really well to the move and fit in with everyone in our family and it felt like we had always known them. Now, we also had known that they had a half-sister, that the boys didn’t even know existed, but we were told that extended family were adopting her, so we never thought any more about it, because she wasn’t really in the picture…………Well in June of 2015 we were told that their sister may not be adopted after all. And of course we were interested in adding her to our family, so we said yes! On August 4th 2015 their half-sister Maria (4) moved in with us. The same thing happened with her as with the boys…..she fit into the family perfectly and the boys are great big brothers to her. 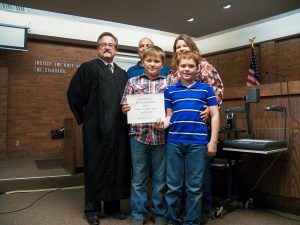 Again on November 23rd, this time 2015 we had gone to read her file and on the ride home, received an email from our adoption attorney, telling us that the date had been set for the boy’s adoption and on December 9th 2015, Axavier and Zetan became a Vink. We had asked them if they wanted to keep their middle names, and Zetan said yes, but Axavier asked my husband “what is your middle name?” he told him and then Axavier said “I want that to be my middle name too, because you have been more of a father to me than anyone else has”. Yep, there were tears! 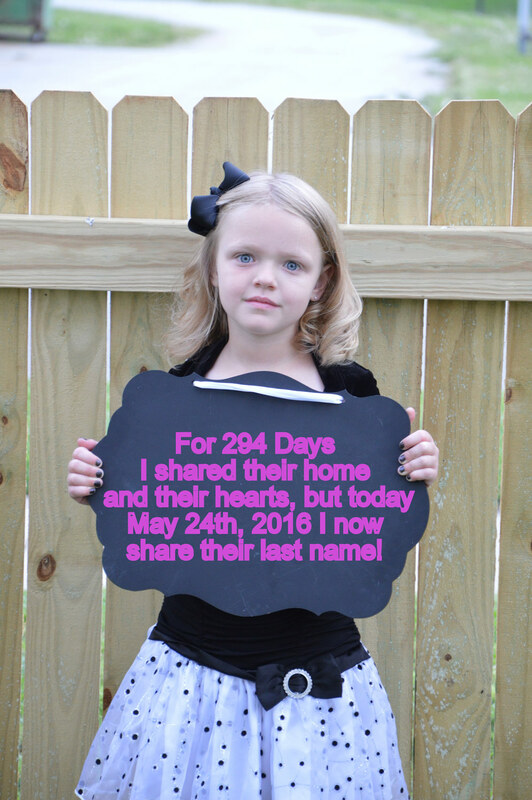 On May 9th, 2016 we received word that Maria’s adoption would take place on May 24th 2016. We had asked her as well if she wanted to change her name and she did want to change her middle name, which this is another reason we knew we were all meant to be together, because back on day one when she moved in, she asked my husband if she could have a nickname or change her name and my husband said “sure if you want to, what would you like it to be”……….and I can’t make this stuff up, but my husband and I had a name picked out that we wanted to name our daughter if we ever had a daughter and yep you guessed it, it was the same name and my husband and I just looked at each other and shook our heads and knew she was meant to be here. Our family was completed on May 24th 2016. And our lives have changed a ton…….we are always on the go with practices, Daisy Scouts, friend’s houses, fishing and going to Worlds of Fun. 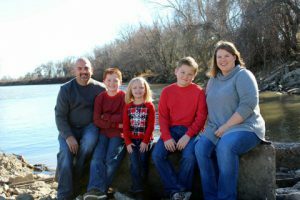 We went from 0 to 3 kids in less than a year and it is hectic and crazy and at times we feel like we are losing our minds, because we have so much going on, but we wouldn’t have it any other way? They mean everything to us and we only want the best for them no matter what that is and can only hope that we have made a difference in their lives, like they have in ours!! Adoption is special to us….1 because my husband was given that chance to know what family is because of adoption and 2 because we are lucky to have these 3 kiddos call us mom and dad and let us be what they need. Our family is complete for now, because we have learned you never say never! For those who are considering this crazy rollercoaster ride, it is definitely worth every crazy minute of it when you see those smiling faces!! Thank you for letting me share our story with you!